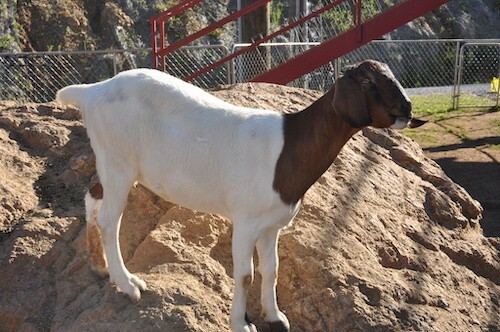 One of the top things you have to experience while visiting Goats on the Roof is gem mining! This is an exciting opportunity to do some prospecting just like the old timers did in the American West! You start with a bucket of gem rich soil and then sift it through an authentic water sluice. Once the moving current of water washes the soil away from your screened tray, you may get lucky enough to find some treasures remaining behind! This open air attraction is delightful on a warm day, but it is also covered for protection from inclement weather. 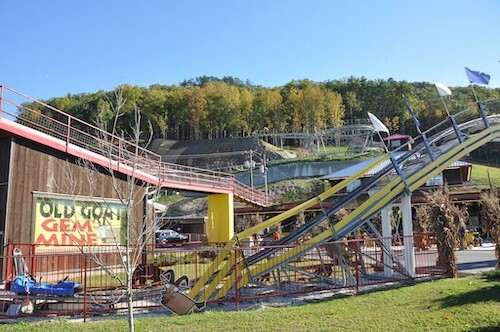 If you are a thrill seeker, you are going to love taking a ride on the Coaster at Goats on the Roof! This amazing mountain coaster puts you in the driver’s seat as you control the speed of your own sled on the tracks down the mountain! During your journey, you can reach speeds of nearly 30 miles per hour by using your personal hand brake to let it rip! Each of the coaster carts are equipped to handle one or two people, so you can ride with your child or your best friend! Just keep in mind that the person controlling the sled must be a minimum of 54 inches tall and at least 16 years old. When it comes to the best variety of Smoky Mountain souvenirs, there is no better place to look than the Goats Shop at Goats on the Roof! This gift shop features souvenirs such as t-shirts, old fashioned candy, locally made moonshine jelly, and even hillbilly themed novelty items! If you step outside onto the front porch, you will also find authentic Amish woodcrafts such as feeders and rocking chairs. 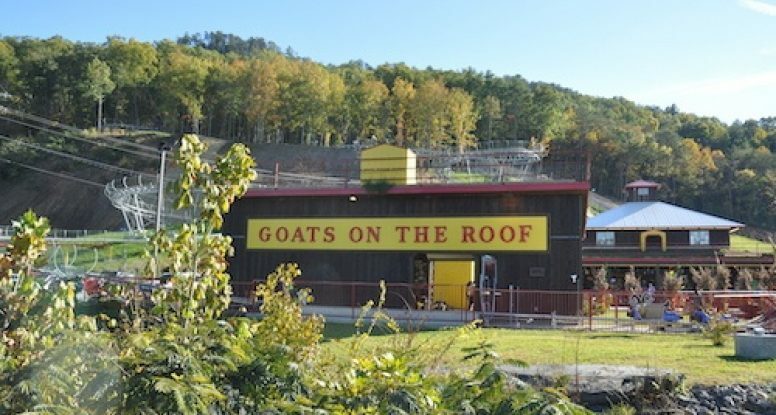 Don’t forget to pick up a Goats on the Roof t-shirt to remember your time at this fun and quirky attraction! 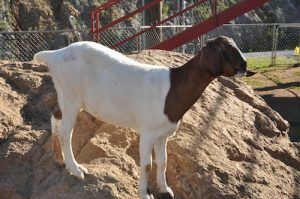 No visit to Goats on the Roof is complete without visiting with the cute goats that started it all! There really are live goats roaming around on the rooftop, which you can view up close from the second level of the gift shop. If you want to feed the goats, simply purchase a can of goat chow and hop on the special “goat cycle” to transport the can of food up to the goat! This is the perfect time to take a photo of the goats chowing down on their favorite snack! Check out all of our cabins in Wears Valley TN today to plan your vacation near Goats on the Roof! We look forward to seeing you soon at Hearthside at the Preserve!